Myths, legends, folklore and tales of the dark. While on duty at the rescue headquarters on the 19th April 1972, Graham Grant is said to have watched a very large black dog running on the sand, it would stop every so often to look around, then before his eyes vanished in the middle of the beach! On this day in 1857 - The Spirits Book. On this day - April 18th in 1857 - the famous book, regarded as the most important in the spiritist movement was published, The Spirits Book by Allan Kardec. It is composed mainly of a collection of questions about the origin of spirits, what the afterlife entails, the concepts of good and evil and ultimately the purpose of life. The answers were provided by a group of spirits who called themselves 'The Spirit of Truth' and he communicated with them in many sessions during the 1850's. It contains many concepts that we still grapple with today, and is still available (on Amazon would you believe it?! See link below) including do spirits pre-exist and survive physical matter, are there good and evil spirits, reincarnation and guardian 'angels'. Fascinating stuff, and groundbreaking especially for the time. The Hanging of Derek Bentley. On the 28th January 1953 (very much in living history), Derek Bentley who was 19 was hanged for the murder of a policeman which was committed during an attempted robbery. The case sparked a huge public controversy and many people questioned the sentence and it's circumstances. Bentley was proven to have many health and developmental issues and had been tested for such previous to and during the trial. He had epilepsy and a low I.Q, being described as "quite illiterate" with a reading age of just 4 1/2 years old. This obviously led to concerns about culpability and whether he was capable of recalling events accurately when questioned, especially under pressure. At the time the murder was attributed to Bentley's friend and partner in crime Christopher Craig who was then aged 16, however this was later called into question and Bentley was convicted as a party to murder in no small part to a comment he is supposed to have made of "let him have it". Judge Chief Justice Goddard described Bentley as "mentally aiding the murder of Police Constable Sidney Miles" and sentenced him to death by hanging which was apparently the only suitable sentence. Following many years of controversy and appeals by the family (his parents until their deaths then by his sister until hers) and many people caught up in the case Bentley was given a posthumous Royal pardon in 1993, his conviction was eventually quashed in 1998. Many plants have legends and folklore associated with them throughout the world, established and native ones especially. The pretty, wild plant periwinkle is no exception and the mythology linked with it – both good and bad - is very interesting. In folklore, periwinkle, the evergreen trailing plant which has delicate, five-petaled flowers in shades of white and purple-blue, is thought to have powers associated with ghosts, spirits, witches and the dead. It was traditionally grown on graves and used in garlands for the recently deceased but more often than not periwinkle would grow naturally in graveyards thus empowering the belief that it was intrinsically linked with death. In many countries it was used as a funeral plant specifically for children, often woven into wreaths to be placed on top of their coffins, as it was thought this would help them on their way to the afterlife. Mostly seen as a protective plant or having a guardian duty for the dead it was not to be feared but respected, however in Welsh folklore it is said that if a periwinkle flower is picked from a grave the person will be haunted for one year by the dead spirit. People often used periwinkle for its protective properties and there was a lot of superstition surrounding its use. If harvesting periwinkle for magical use there were some strict rules to follow, the person should be free of all illness, and it could only be picked on certain nights of the month depending on the moon’s phase, only then could it be used properly. Periwinkle was commonly hung in wreaths or bunches on the front doors of houses and other important buildings to protect them and their occupants from evil and to ward off vermin and pests, travellers would also carry periwinkle with them for protection from wild beasts and bad fortune. There were some very positive qualities connected to periwinkle too, in Germany for example it was regarded as the plant of immortality and was grown in abundance, it is also said to increase passion if scattered underneath the bed of lovers! These days periwinkle has been classed as a bit of a pest as it grows very quickly and in most climatic conditions, indeed in the USA it is illegal to plant it in some states because it is so rampant, but it has a long and fascinating history and deserves to be admired for its important heritage. Blue Monday...how are you feeling?! It has been calculated (by an actual mathematical formula no less) that typically the third Monday of January is the most depressing of days. A combination of post Christmas blues, self-hatred of failing in New Year's resolutions (a great reason not to make any in my opinion), bills arriving through the letterbox and the generally dark, dull, damp, cold weather. I do agree that January seems never-ending, it's only the 21st today and it feels like the month has gone on for ages. The thing is, if this is the drabbest of days, things surely can only get better...the days increase in length and although we are bound to get colder weather yet, spring is on the way - snowdrops are peeping through and there is light at the end of the tunnel. So I try to look forward, take my vitamin d supplements and think of this all being over. Far too cheerful...back to researching dark things! Hi folks, hope you had a fantastic festive period whatever you did and however you celebrated, I can't believe its 2019 already...I remember celebrating the millennium and it really doesn't seem that long ago! There are many things planned for this year, mostly research for a book I am compiling as well as the usual keeping up to date with the stranger goings-on in the world...far too much time spent browsing on Twitter and not enough posting...can't see that changing to be honest. Anyway, just checking in, first post of the year and all that. Incidentally today would have been Professor Stephen Hawking's 77th birthday, he was born 300 years to the day since Galileo died (plus he died on Einstein's birthday...spooky) men of science all linked in time, fascinating stuff. 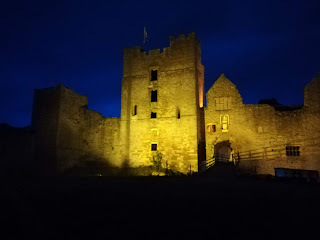 Ludlow Castle and the ghost of Marion de la Bruyere. Ludlow Castle is a stunning and imposing ruin that sits high on a perfect vantage point overlooking the River Teme. It is thought to have been founded by Walter de Lacy after the Norman Conquest and is one of the most impressive Medieval castles in England as well as being one of the first stone castles built here. It is a very popular tourist destination being open for most of the year, it plays host to several events in the town including Ludlow's famous food festivals and it's Medieval Fayre each November. However for those of us with an interest in the darker side of things, Ludlow Castle also has it's fair share of haunting stories, the most famous being that of Marion de la Bruyere - a favourite tale to school children in the area who were all taught it...me included as it is my home town. She dates right back to the 12th century when she was resident in the castle, at the time there were some soldiers imprisoned there from the enemy's side, one of these was Arnold de Lys with whom she fell in love. Following his exit from the castle they continued their affair in secret as he was on the side of the enemy, she would lower a rope from the battlements for him to climb and their visits continued. However one night he purposefully left the rope hanging down so it was available to his comrades who entered the castle and murdered many of it's inhabitants. Marion was so distraught by his betrayal she grabbed his sword and killed him with it, then overcome by grief and guilt she threw herself from the top of Pendover Tower and fell to her death. There have been since - right up to the present day - reports of her ghost at dusk. Some say it is seen reenacting her fall to death, screams have been heard and others recount that they have seen the ghost wandering at the base of the tower, whichever way, she still seems to be present in the ruins after all this time. Welcome to the site! 'Home' is the main blog where all posts are...well...posted, and the pages across the top are where the subjects are archived for easy searching - hope you have fun here.